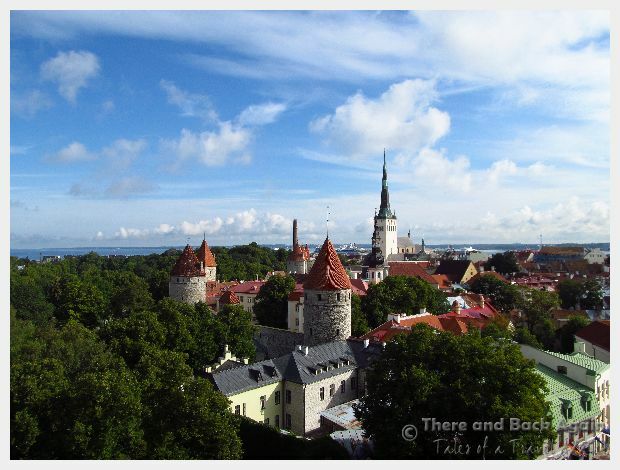 One Day In Tallinn Estonia - Shopping, Strolling and Being Enchanted! 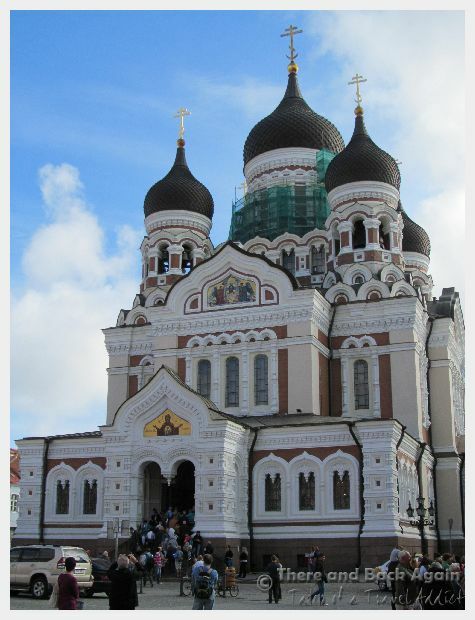 We only had a vague idea of how we would spend ne day in Tallinn Estoniawhen we got off the cruise ship and started exploring. If you are in the same boat, wondering what to do in Tallinn for a day on your cruise ship port day, we have some great suggestions for you! We have specific suggestions below for where to get the best views, how to avoid the crowds and where to do the best shopping! 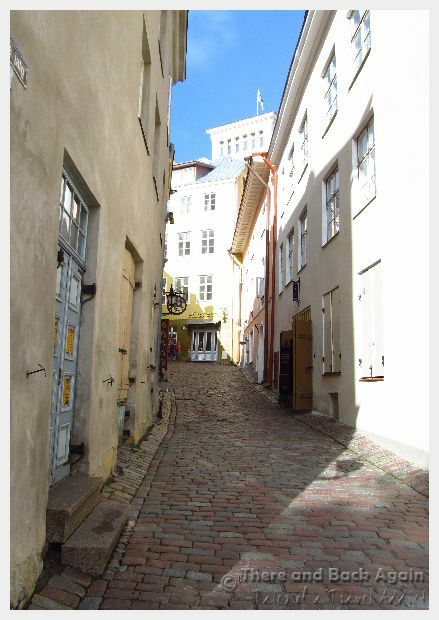 Walking around the old town of Tallinn Estonia feels like walking in your own personal fairy tale. Tallinn is a city of red tiled roofs, views of fairy tale towers, and winding cobblestone streets lined with inviting cafes. Have you ever been to a Renaissance Festival? Tallinn Estonia felt a lot like that, except it had real cobblestone streets and authentic 13th-16th century buildings! Many of the vendors in the old town dress in traditional costume of the period, and there are many restaurants serving traditional Estonian food (including wild boar.) There are many crafts people who practice traditional old time crafts, making Tallinn a great place to shop for unique souvenirs. 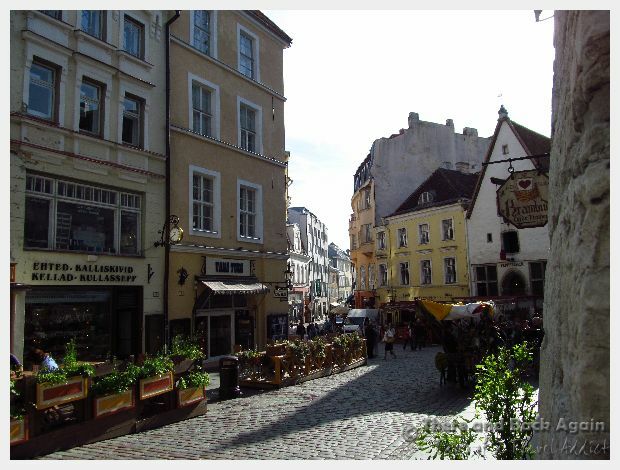 The city is made for walking, though the streets are all covered in rough cobblestones. The streets in the Old Town are so narrow that bus tours cannot go there. Oh my gosh, another adorable street! The whole town was just waaaay too cute! 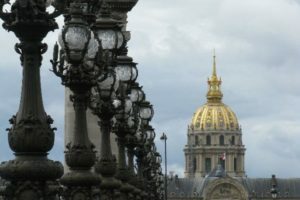 If you are mobility impaired or can’t walk long distances, you can take a Segway tour through the old town or you could hire a bicycle taxi to take you on a tour. 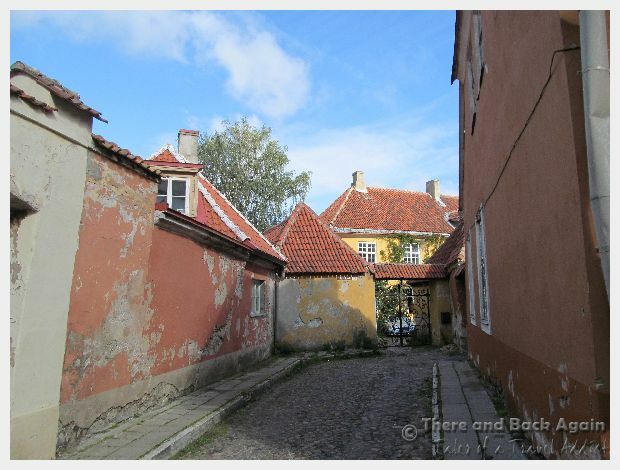 The Old Town in Tallinn Estonia is one of the highlights of your visit and should not be missed! 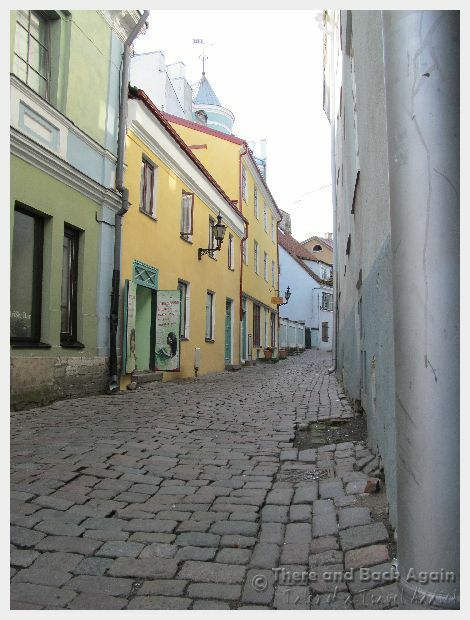 This photo was taken right along the main tourist drag in Tallinn where any of the shops and restaurants are. There are an abundance of great places to eat with a view! Sightseeing Tip: You can walk on top of a 200 meter section of the old city wall near the knit market on on Müürivahe street to get a unique vantage point! 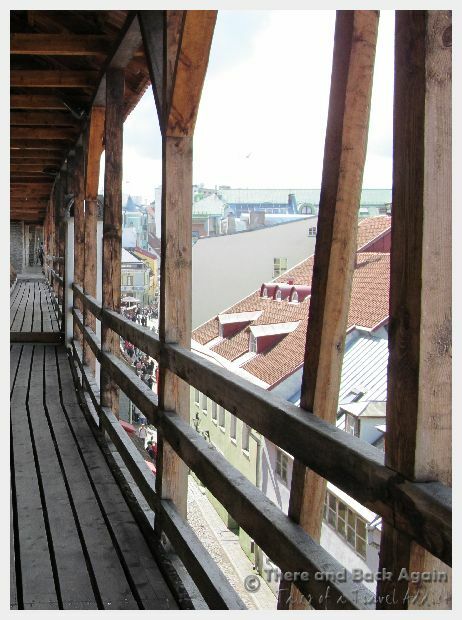 You can climb up and walk on a section of the old city walls above Tallinn. This was one of our favorite tings that we did during one day in Tallinn. The views and photos from the top were really noteworthy. Also, make sure you make it up Toompea Hill. In addition to being the site of the Toompea castle and Tallinn’s administrative seat, there are some beautiful photo opportunities in the form of scenic viewing platforms that will give you a panoramic view of Tallinn’s iconic spires and red tiled roofs. There is a price to pay for being in this incredible, authentic medieval atmosphere. You won’t be alone. As the afternoon progressed, the town became increasingly crowded and hard to navigate. As we were walking around, we had to carefully maneuver around large tour groups (there were at least 4 cruise ships docked in port that day). 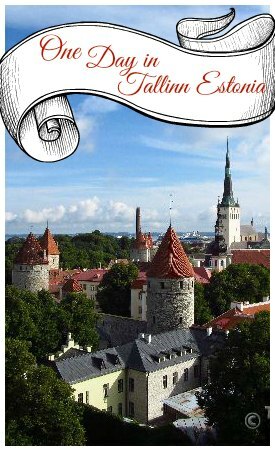 The best way to take advantage of these great suggestions for what to do in Tallinn for a day is to get out early! 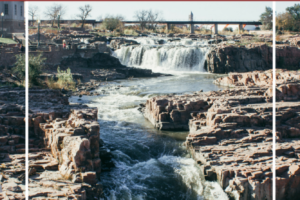 Try to get your sight seeing and picture taking done before lunch. Then, in the afternoon spend some time shopping in the great shops and tuck into a pub or restaurant for some lunch. For those putting together a Tallinn itinerary who are wondering what to do in Tallinn for a day, shopping definitely deserves a top stop on your list! The craftsmanship was top notch and the prices were super reasonable. High quality woolen goods at great prices (hats, scarves, sweaters, slippers, etc.) There is a collection of crafters who sell wooden goods just inside the wall on Müürivahe street. 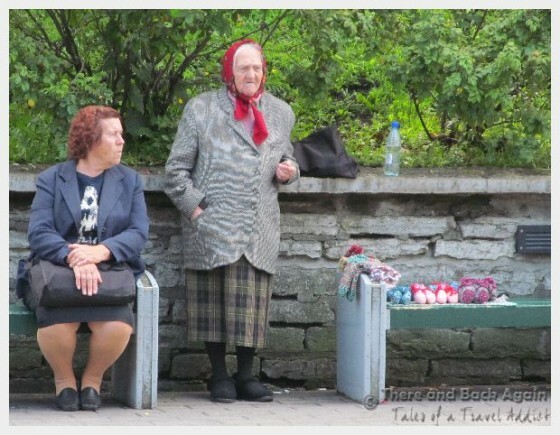 We also saw little old Estonian women on benches selling their handmade goods around the city. Baltic Amber: I know a little about Baltic Amber prices, and the prices in Estonia were the best that we have seen on the whole trip (cheaper than in Russia). The jewelry looked well made and was attractive in design. If you have been waiting to buy a piece of amber jewelry, this might be your place. Honey and Home Made food goods: We stopped at a great little shop called Eesti Esindus that sold some of the best honey that I have ever had, as well as other local food products and other goods made in Tallinn. They provided great samples! Hand made wooden goods: Spoons, bowls, jewelry and other home goods are readily available from vendors around the city. I bought some great wooden buttons made from local wood for a jacket that I have! Hand blown glass ware: We shied away from shopping for glass ware as it is just one more thing to worry about breaking as we travel home, but we saw some shops with wonderful, unique looking glass pieces. Shopping is a popular activity if you are spending one day in Tallinn. These women were selling handmade knitted goods. 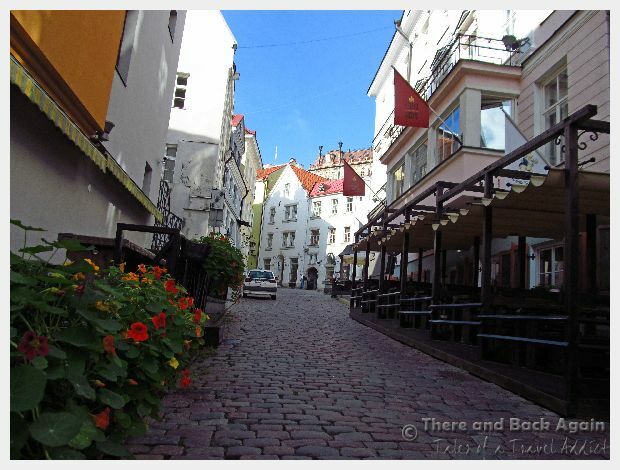 Tallinn is a very easy city to see on your own, without having to take an organized tour. The walk into the old town from the cruise port was only about 10-15 minutes. There is a tourist information office right in the gift market/cafe near the pier. 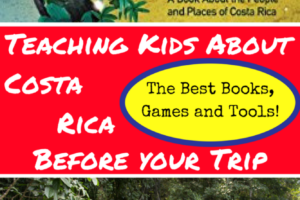 Here, you can rent audio guides for the day to take you on a do it yourself walking tour, or you can buy a book with maps and suggested highlights and commentary. I normally avoid shopping at the little souvenir market that is usually set up right by the cruise ship pier because it is generally either cheap, generic goods or much higher in price. In Tallinn, neither of these was true. As advertised, the market by the cruise ship pier did offer a wide variety of hand made crafts from Estonia at some of the best prices that I saw in the whole city (the buttons that I bought would have been a whole euro less each had I bought them there). 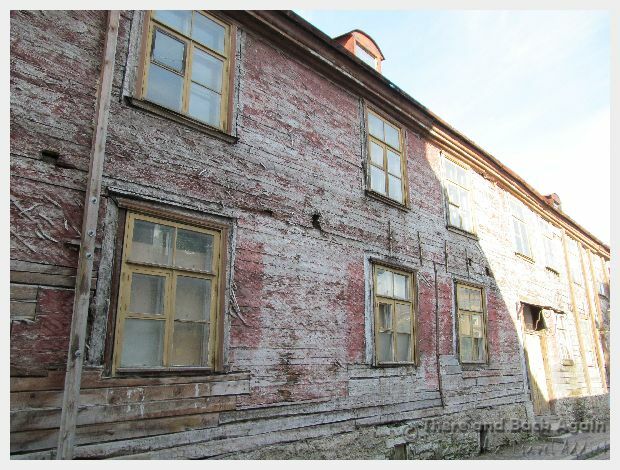 This building was showing its age an character. The city is awash with buildings filled with character. 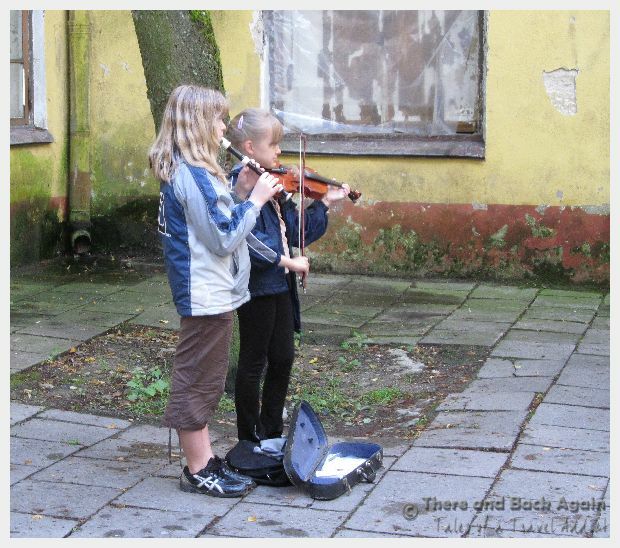 These little girls playing their instruments for tourists broke our hearts. Poverty exists everywhere.